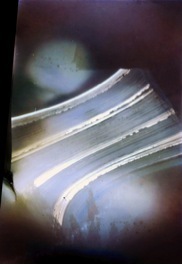 A solargraph of six months duration from Flagstaff, Arizona, USA, sent me by Becky Ramotowski. This was placed at the observatory at Anderson Mesa by astronomer, Brian Skiff. The pinhole camera was out from the Winter Solstice 2008 until Summer Solstice 2009. We are really impressed with the beautiful tracks the Sun left behind documenting the clouds / weather for that time period. Still I am wondering these four regular sunny weeks during these six months. I never have seen this kind of regularity before in solargraphs. If someone had similar results in solargraphs it would be interesting to see them. These pages are interactive and feel free to send your comments. Do not mind if your comment was not immediately visible on this page. Because of some spams comments had been sent so often, it is better to confirm the comments without trouble links.